It's widely accepted that a major promotion in a person's career would normally spur them on to chase further success. 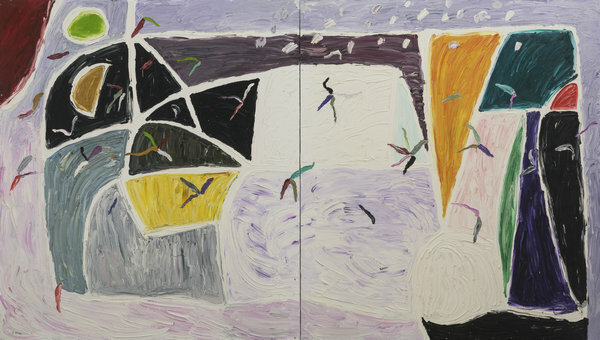 For the late Gillian Ayres, however, the prominent British abstract artist's most creative period began after she abandoned a promising career in teaching. In 1981, just three years after becoming the first woman to direct a painting department at a British art school, she resigned and moved her family away from the busy metropolitan life, to a remote part of the countryside, where, in closer touch with nature, she focused on painting. She produced big, vibrantly colored oil paintings that burst with energy and generosity. Her canvasses from this period offer a full expression of the enchantment of her surroundings, as well as the vigor of her character. Ayres' oeuvre was first introduced to a Chinese audience when an exhibition of her work, Sailing off the Edge, was held at the art museum in Beijing's Central Academy of Fine Arts last year. She didn't attend the opening due to her failing health, to which she eventually succumbed, passing away in April, aged 88.